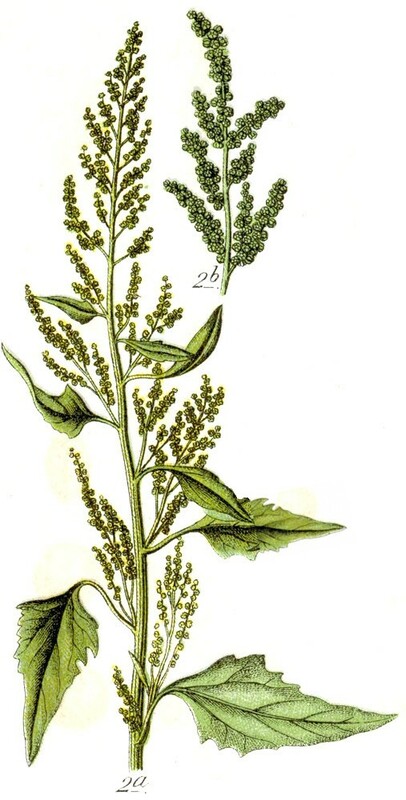 Chenopodium urbicum is an annual, C3 herb (Jacobs 2001), 0.3-1 m tall, erect, branches divergent from base to apex. Leaves alternate, to 8 cm long, 5 cm wide, rhombic- to egg-shaped or triangular, tip pointed, base truncate, margins coarsely toothed, bright green, shiny above, white-mealy below, at least when young. Flowers minute, calyx 5-parted, lobes rounded on back; inflorescence of spikes with flowers in dense clusters, calyx 5-parted, segments rounded. Fruit dry, 1-seeded, seeds horizontal, 0.1 cm; blooms and fruits July-Oct.
Habitat: Open areas, vacant lots.